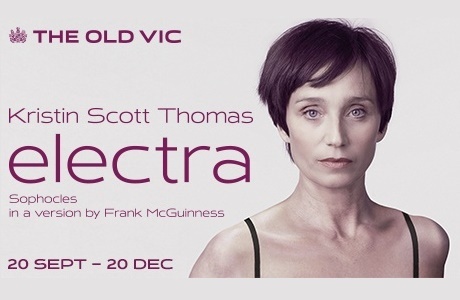 Currently showing at the Old Vic is Frank McGuinness’ adaptation of Sophocles’ Electra. After years, the Greek heroin is still grieving for her father Agamemnon’s death and constantly obsesses about vindicating him. Electra is trapped in her grief and can only think about is to murder her remarried mother who she considers responsible for her father’s loss. The vengeance finally comes through the hand of her returning twin brother Orestes. Once again, McGuinness created a sensational adaptation that doesn’t belong to any specific point in time or place. The audience embarks with the actors into an emotional journey through Electra’s disturbing thoughts. The plot revolves around the anger and the obsessive desire of revenge of Sophocles’ heroin and culminates in a bloody conclusion. The setting is minimalistic – it only consists of a barren tree, a standing tap and the royal palace’s forecourt – but it creates the perfect background for the tragedy unfolding under the audience’s eyes. Part of the Old Vic’s in-the-round season, the production gives the audience to be part of the staging and to watch the performance very closely. The whole supporting cast is extremely talented; in particular, Electra’s mother played by Diana Quick. She beautifully portrays her internal conflict, how she is torn between feelings of guilt and unconditional love towards her children. Kristin Scott Thomas, the absolute star of the show, delivers a very powerful performance. This is not only another proof of her extraordinary ability to adapt to any script but also a visceral performance that uncovers new aspects of her acting. Many of her previous roles are characterised by her extremely poised attitude with a touch of chic; as Electra, Kristin turns into a neglected, greasy woman who grubs in the dirt. Electra is not known as an easy-to-like and joyful play to see but McGuiness’ adaption and the cast talent definitely make it worth seeing.